"Lorraine Warren" redirects here. For the New Zealand academic, see Lorraine Warren (academic). Edward Warren Miney (September 7, 1926 – August 23, 2006) and Lorraine Rita Warren (née Moran; January 31, 1927 – April 18, 2019) were American paranormal investigators and authors associated with prominent cases of hauntings. Edward was a World War II United States Navy veteran and former police officer who became a self-taught and self-professed demonologist, author, and lecturer. Lorraine professed to be clairvoyant and a light trance medium who worked closely with her husband. In 1952, the Warrens founded the New England Society for Psychic Research, the oldest ghost hunting group in New England. They authored numerous books about the paranormal and about their private investigations into various reports of paranormal activity. They claimed to have investigated over 10,000 cases during their career. The Warrens were among the very first investigators in the controversial Amityville haunting. According to the Warrens, the N.E.S.P.R. uses a variety of individuals, including medical doctors, researchers, police officers, nurses, college students, and members of the clergy in its investigations. Stories of ghost hauntings popularized by the Warrens have been adapted as or have indirectly inspired dozens of films, television series and documentaries, including 17 films in the Amityville Horror series and five films in The Conjuring Universe with two more yet to be released. Skeptics Perry DeAngelis and Steven Novella have investigated the Warrens' evidence and described it as "blarney". Skeptical investigators Joe Nickell and Ben Radford concluded that the more famous hauntings, Amityville and the Snedeker family haunting, did not happen and had been invented. According to the Warrens, in 1968, two roommates claimed their Raggedy Ann doll was possessed by the spirit of a young girl named Annabelle Higgins. The Warrens took the doll, telling the roommates it was "being manipulated by an inhuman presence", and put it on display at the family's "Occult Museum". The horror films Annabelle, Annabelle: Creation, and upcoming Annabelle Comes Home, spin-off prequels of The Conjuring are loosely based on the Warrens' story. In 1971, the Warrens claimed that the Harrisville, Rhode Island, home of the Perron family was haunted by a witch who lived there in the early 19th century. According to the Warrens, Bathsheba Sherman cursed the land so that whoever lived there somehow died a terrible death. The story is the subject of the 2013 film, The Conjuring. Lorraine Warren was a consultant to the production and appeared in a cameo role in the film. A reporter for USA Today covered the film's supposed factual grounding. The Warrens are probably best known for their involvement in the 1976 Amityville Horror case in which New York couple George and Kathy Lutz claimed that their house was haunted by a violent, demonic presence so intense that it eventually drove them out of their home. The Amityville Horror Conspiracy authors Stephen and Roxanne Kaplan characterized the case as a "hoax". Lorraine Warren told a reporter for The Express-Times newspaper that the Amityville Horror was not a hoax. The reported haunting was the basis for the 1977 book The Amityville Horror and adapted into the 1979 and 2005 movies of the same name, while also serving as inspiration for the film series that followed. The Warrens' version of events is partially adapted and portrayed in the opening sequence of The Conjuring 2 (2016). According to Benjamin Radford, the story was "refuted by eyewitnesses, investigations and forensic evidence". In 1979, lawyer William Weber reportedly stated that he, Jay Anson, and the occupants "invented" the horror story "over many bottles of wine". In 1977, the Warrens investigated claims that a family in the North London suburb of Enfield was haunted by poltergeist activity. While a number of independent observers dismissed the incident as a hoax carried out by "attention-hungry" children, the Warrens were convinced that it was a case of "demonic possession". The story was the inspiration for The Conjuring 2, although critics say the Warrens were involved "to a far lesser degree than portrayed in the movie" and in fact had shown up to the scene uninvited and been refused admittance to the home. In 1981, Arne Johnson was accused of killing his landlord, Alan Bono. Ed and Lorraine Warren had been called prior to the killing to deal with the alleged demonic possession of the younger brother of Johnson's fiancée. The Warrens subsequently claimed that Johnson was also possessed. At trial, Johnson attempted to plead Not Guilty by Reason of Demonic Possession, but was unsuccessful with his plea. The case was described in the 1983 book The Devil in Connecticut by Gerald Brittle. The story will be the subject of the upcoming film The Conjuring 3 (2020). In 1986, Ed and Lorraine Warren arrived and proclaimed the Snedeker house, a former funeral home, to be infested with demons. The case was featured in the 1992 book In a Dark Place: The Story of a True Haunting. A TV movie that later became part of the Discovery Channel series A Haunting was produced in 2002. The Haunting in Connecticut, a film very loosely based on the Warrens' version of events and directed by Peter Cornwell, was released in 2009. Horror author Ray Garton, who wrote an account of the alleged haunting of the Snedeker family in Southington, Connecticut, later called into question the veracity of the accounts contained in his book, saying: "The family involved, which was going through some serious problems like alcoholism and drug addiction, could not keep their story straight, and I became very frustrated; it's hard writing a non-fiction book when all the people involved are telling you different stories". To paranormal investigator Ben Radford, Garton said of Lorraine "'if she told me the sun would come up tomorrow morning, I'd get a second opinion'". Pennsylvania residents Jack and Janet Smurl reported their home was disturbed by numerous supernatural phenomena, including sounds, smells and apparitions. The Warrens became involved and claimed that the Smurl home was occupied by four spirits and also a demon that allegedly sexually assaulted Jack and Janet. The Smurls' version of their story was the subject of a 1986 paperback titled The Haunted and a 1991 made-for-TV movie of the same name directed by Robert Mandel. In 1991, the Warrens' book Werewolf: The True Story of Demonic Possession was published in which they claim to have exorcised a demon manifesting itself as a "werewolf". Ed Warren's book Graveyard: True Hauntings from an Old New England Cemetery (St Martins Press, 1992) features a "White Lady" ghost which haunts Union Cemetery. He claimed to have captured her essence on film. The Warrens were responsible for training several demonologists including Dave Considine and their nephew John Zaffis. In addition to investigations, Lorraine ran The Warrens' Occult Museum in the back of her house in Monroe, Connecticut with the help of her son-in-law, Tony Spera. According to a 1997 interview with the Connecticut Post, Steve Novella and Perry DeAngelis investigated the Warrens for the New England Skeptical Society (NESS). They found the couple to be pleasant people, but their claims of demons and ghosts to be "at best, as tellers of meaningless ghost stories, and at worst, dangerous frauds." They took the $12.50 tour and looked at all the evidence the Warrens had for spirits and ghosts. They watched the videos and looked at the best evidence the Warrens had. "Their conclusion: It's all blarney." They found common errors with flash photography and nothing evil in the artifacts the Warrens had collected. "They have... a ton of fish stories about evidence that got away... They're not doing good scientific investigation; they have a predetermined conclusion which they adhere to, literally and religiously," according to Novella. Lorraine Warren said that the problem with Perry and Steve "is they don't base anything on a God". Novella responded, "It takes work to do solid, critical thinking, to actually employ your intellectual faculties and come to a conclusion that actually reflects reality ... That's what scientists do every day, and that's what skeptics advocate". In an article for the Sydney Morning Herald that examined whether supernatural films are really based on true events, that investigation was used as evidence to the contrary. As Novella is quoted, "They [the Warrens] claim to have scientific evidence which does indeed prove the existence of ghosts, which sounds like a testable claim into which we can sink our investigative teeth. What we found was a very nice couple, some genuinely sincere people, but absolutely no compelling evidence..." While it was made clear that neither DeAngelis nor Novella thought the Warrens would intentionally cause harm to anyone, they did caution that claims like the Warrens' served to reinforce delusions and confuse the public about legitimate scientific methodology. 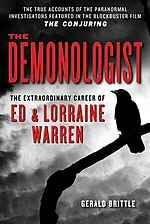 The Demonologist: The Extraordinary Career of Ed and Lorraine Warren by Gerald Brittle was released as an ebook for the opening of The Conjuring based on the Warrens' life story. Ed and Lorraine appeared in the first episode of The Challenge, then titled Road Rules: All Stars. In the episode, they tasked alumni from The Real World to spend the night in a haunted mental hospital in Connecticut and prove the existence of the ghosts there. Lorraine was featured in several episodes of the Discovery series A Haunting, in which she discusses some of the cases the pair worked on as paranormal investigators. Lorraine also appeared on Paranormal State, where she acted as a guest investigator. Both Ed and Lorraine have appeared on Scariest Places on Earth. Lorraine has a cameo appearance in the 2013 film The Conjuring, where she is also credited as a consultant. Lorraine is visited during the 2012 documentary film My Amityville Horror, where she reunites with Daniel Lutz, whose family was allegedly plagued by supernatural happenings in 1975. Ed and Lorraine Warren originally visited the house after the Lutz family fled the house after 28 days of occupancy. In 1991, a two-hour made-for-TV film based on the Smurl haunting, titled The Haunted, was released by 20th Century Fox. Written by Robert Curran, Jack Smurl, Janet Smurl, Ed Warren and Lorraine Warren, the film starred Jeffrey DeMunn as Jack Smurl and Sally Kirkland as Janet Smurl. The 2009 film The Haunting in Connecticut was loosely based on the 1986 Snedeker haunting investigated by the Warrens. The Warrens' case files serve as the basis for The Conjuring Universe series of horror films. The 2013 film The Conjuring was directed by James Wan. Based on a Warren case, it stars Patrick Wilson and Vera Farmiga as Ed and Lorraine Warren. In 2014, Annabelle, a supernatural psychological horror film directed by John R. Leonetti was released. It is both a prequel to and spin-off of The Conjuring and was inspired by a story of a possessed doll named Annabelle. It stars Annabelle Wallis, Ward Horton, and Alfre Woodard. The 2016 film The Conjuring 2, a sequel to The Conjuring, was directed by Wan, with Farmiga and Wilson reprising their roles as Lorraine and Ed, respectively. It's based on the Enfield Poltergeist case. In 2017, Annabelle: Creation was released as a prequel to Annabelle, telling the origin story of the Annabelle doll. Farmiga and Wilson appeared as Ed and Lorraine in the 2018 spin-off film The Nun, focusing on the character of Valak on its "Demon Nun" form who was the villain from The Conjuring 2. The two reprised their roles in the upcoming Annabelle Comes Home, the sequel to Annabelle. ^ Brown, Alan (September 30, 2008). Ghost Hunters of New England. Lebanon, New Hampshire: University Press of New England. p. 3. ^ a b Patrick, Mike (October 24, 1997). "Truth or Scare? Ghost hunters' stories fail to rattle skeptics" (Vol 6). Connecticut Post. pp. Front Page, A14. ^ a b Nickell, Joe. "Demons in Connecticut". Skeptical Inquirer. CSI. Retrieved August 17, 2011. ^ a b Radford, Benjamin. "The Amityville Horror". Urban Legends Reference Pages. Snopes.com. Retrieved October 25, 2011. ^ McLoughlin, Pam (October 5, 2014). "Real 'Annabelle' story shared by Lorraine Warren at Milford's Lauralton Hall". New Haven Register. Retrieved 24 February 2015. ^ a b Elsworth, Peter (July 17, 2013). "'The Conjuring' depicts family's reported haunting in Burrillville farmhouse in '70s". The Providence Journal. Retrieved July 21, 2013. ^ Alexander, Bryan (July 22, 2013). "The 'true' story behind 'The Conjuring'". USA Today. Retrieved August 5, 2013. ^ Downes, Lawrence (April 14, 2005). "Editorial Observer; The Devil We Know on the Island We Love". New York Times. Retrieved August 17, 2011. ^ Associated Press (July 27, 1979). "'Amityville Horror 'amplified over bottles of wine, - lawyer". Lakeland Ledger. Retrieved October 25, 2011. ^ Nickell, Joe (3 July 2012). "The Science of Ghosts: Searching for Spirits of the Dead". Prometheus Books. pp. 281–. ISBN 978-1-61614-586-6. ^ Hawkes, Rebecca. "What did the Enfield Haunting have to do with Ed and Lorraine Warren?". Telegraph.co.uk. The Daily Telegraph. Retrieved 4 September 2016. ^ Lynne Baranski (October 26, 1981). "In a Connecticut Murder Trial, Will (demonic) Possession Prove Nine-Tenths of the Law?". People Magazine. Retrieved August 17, 2008. ^ Radford, Ben (2017). Investigating Ghosts: The Scientific Search for Spirits. Corrales, New Mexico: Rhombus Publishing Company. p. 201. ISBN 978-0-936455-16-7. ^ Byrnes, Paul (July 12, 2013). "The devil among us". Sydney Morning Herald. Fairfax Publishing. Retrieved 13 December 2014. ^ Beck, Stefan (August 18, 2013). "A Night with The Conjuring's Ed & Lorraine Warren". The Daily Beast. The Daily Beast Company LLC. Retrieved 31 May 2016. ^ Belanger, Jeff. "50 Years of Ghost Hunting and Research With the Warrens" (PDF). TheOneMatrix.com. Retrieved June 11, 2013. ^ Radford, Benjamin (March 26, 2009). "The Real Story Behind 'The Haunting in Connecticut'". LiveScience. Retrieved June 5, 2013. ^ Puchko, Kristy (October 15, 2012). "The Conjuring Reveals Spooky Trailer and Scene, And James Wan Talks Horror As Therapy". Cinema Blend. Retrieved June 5, 2013.